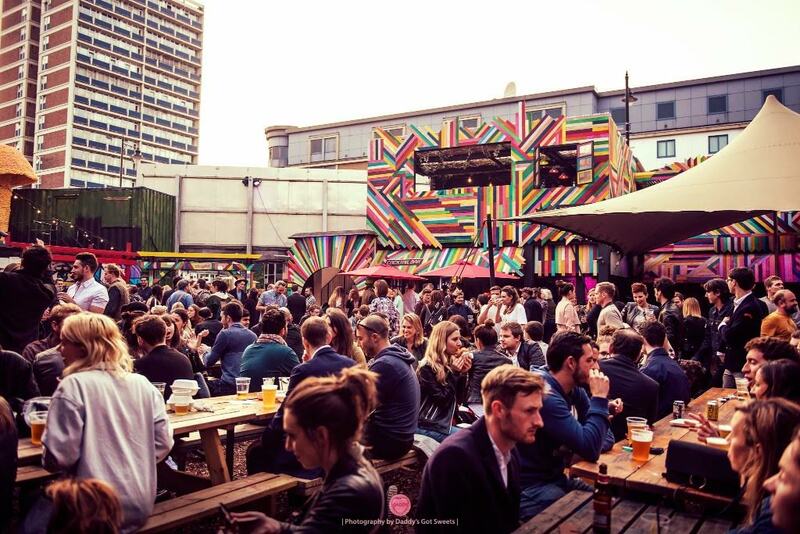 Last Days of Shoreditch, the street food market on the corner of Old Street and Great Eastern Street, returns for the summer of 2017 from Thursday 25th May, to run for the summer, Thurdays to Saturdays. Expect street food from people like Nanny Bill's, an excape room, Lucky Voice karaoke, plus there are bookable private rooms for parties. Its free to get in on Thursdays and Fridays, and £10 after 9pm on Saturdays (plus some nights are ticketed events). This one is going to get very popular! "Endless events are planned for Last Days of Shoreditch Riviera every Thursday, Friday and Saturday with a massive selection of global talent. Some of the many highlights include Artwork's Art's House pre-party, which will see the party starter take to the decks four times over the summer run of events, Maribou State will host an exclusive pre-party seeing the electronic duo turn up the heat while Stuart Patterson, Phil Mison and The Dr Orders will also be joining the summer pop-up amongst many more. Anjunadeep and Soundcrash plus more will also hosting specially curated nights. The highlights from summer schedule can be seen below. Full listing available HERE. Food for the summer season comes courtesy of Nanny Bills serving up a delectable range of burgers, not to mention their signature croquettes with popular favourites including 'Pea & Feta' and 'Mac & Cheese'. Joining them are Belli Freschi, a brand new venture from the team behind Shoreditch's local hidden pearl Bottega Prelibato. With the restaurant serving up authentic Italian dishes Belli Freschi seeks to take that one step further with a bespoke Avocado bar and freshly baked pasta, with a strong focus on vegan and vegetarian options. With music, food and drink taken care of, Last Days of Shoreditch Riviera will bring a mini-adventure of hilarious clue-solving in the form of an escape room experience. Handmade Mysteries presents 'Plumbottom's Magnificent Return', a frantic five minute pop-up that challenges teams of 2-3 players to aid the ghost of Plumbottom with a fun, immersive experience that will bamboozle even the most twisted minds. Complete the challenge in the fastest time possible and win a mysterious prize. Some good old fashioned fun comes to East London in the form of a Lucky Voice karaoke experience, select from over 10,000 songs from latest hits to power ballads and sing the night away with laughs from start to finish. Rooms are available for hire with up to 15 people while a VIP Package is also available. Last Days Of Shoreditch Riviera hold a variety of themed private rooms including the Bowie Bauhaus, Purple Rain and more to host your perfect party or event, available for private hire seven days a week. 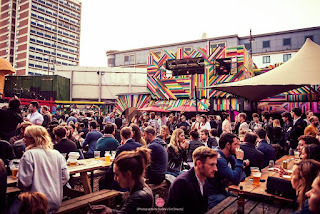 Last Days of Shoreditch Riviera is open every Thursday, 5:00pm – 11:30pm, Friday 5:00pm until midnight and Saturday 6:00pm until midnight, situated on the corner of Old Street and Great Eastern Street."